Situated along the banks of the Little Miami and East Fork rivers, Miami Township is one of the fastest growing and most livable communities in the Greater Cincinnati area. Miami Township is family-friendly with a unique blend of residential and business areas combined with excellent parks, recreational facilities and a township that values its residents. Nestled in the northwest corner of Clermont County, Miami Township is centrally located along the I-275 business loop. Originally founded in 1801 as O'Bannon Township, Miami Township has seen tremendous growth since 1960 as the township transformed from a rural countryside to a bustling suburban community. Today, Miami Township hosts major employers, offers an extensive selection of newer homes, a high level of services and an excellent quality of life. Miami Township was established by Clermont County in 1801. The Township in Ohio is a political subdivision of the state and it has only those powers granted to it by the state legislature. 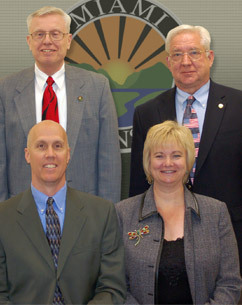 Miami Township operates under the direction of a three-member board of trustees; Mary Makley Wolff, Karl Schultz and Ken Tracy, and a township fiscal officer; Eric Ferry. Miami Township is a "home rule" township. This means that Miami Township possesses a broader authority to enact local regulations much like a city. Miami Township offers services to its residents including police protection, fire & EMS services, road maintenance, zoning and community development and a park system. Miami Township is a largely urban township with a mix of residential, business and parks development. The number for township offices is (513) 248-3725. Miami Township feeds into four local school districts: Milford Exempted Village School District, Loveland City School District, Goshen Local Schools, Clermont Northeastern Local Schools. It is home to Live Oaks Career Development Center, part of the Great Oaks Institute of Technology and Career Dvelopment. Great Oaks works with 36 affiliated school districts throughout Greater Cincinnati and serves approximately 3,200 students annually. Residents have access to Clermont College, Raymond Walters College, University of Cincinnati, Northern Kentucky University, Xavier University and Thomas Moore College which are all just a short drive from Miami Township. There are also more that 100 colleges and universities within Ohio and surrounding areas.